The headset will be paired with the new ‘McLaren Garage VR’ experience – a Vive Studio release in cooperation with McLaren – as well as a custom version of ‘RFactor 2’ McLaren Edition VR racing that was designed to operate without any additional driving accessories. McLaren Garage VR experience is a multi-player simulation game where players can be part of the McLaren pit-crew, learning how to complete tyre adjustments just like crews do in a race. The experience includes the ‘Pit-stop Challenge’, a multiplayer competitive game that allows users to explore McLaren’s latest pit garage in room scale, learn to change a car tyre, and take other players on a timed tyre change challenge. These special edition experiences are available exclusively on VIVEPORT, where current Vive owners can create a subscription today to access these titles for free. With this partnership, HTC Vive and McLaren are offering customers the most immersive McLaren Racing and track experience from the comfort of their own home through VR. 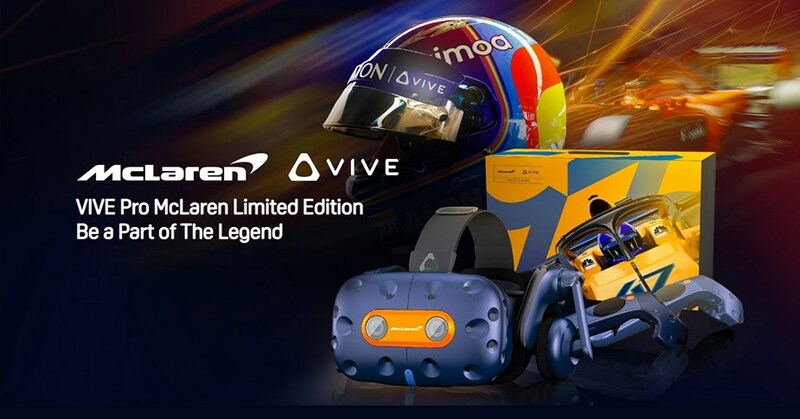 Learn more about the HTC Vive Pro x McLaren VR Kit on the Official HTC Vive Website.